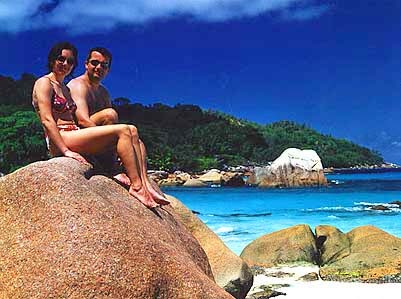 My parents, Petra and I had ten days of relaxation and diving on the island of Mahe in the Seychelles in February 2000. 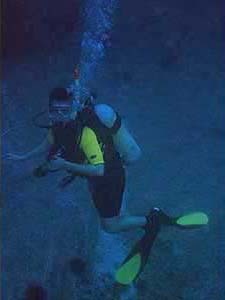 Here are some photos from the trip, including the test shots taken with Dad's underwater camera - Click on the thumbnails to see a full-sized picture. 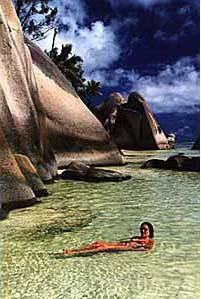 Petra poses on Anse Source Argent beach on La Digue: the most spectacular beach in the world. 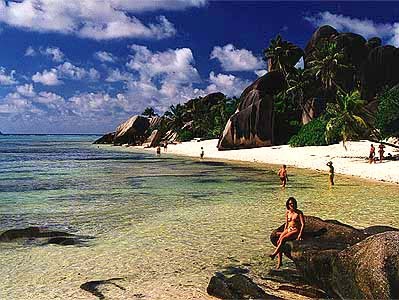 Ah, the typical vista from the Seychelles, this one from Praslin island: turquoise blue seas, white sands and the shade of a willowing palm tree. Another gin and tonic, Garcon! Petra sunbathing in the shallows off La Digue. 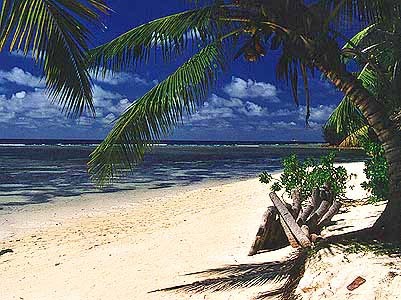 This shot is taken at the famous 'Bacardi Beach' where the rum advert ('taking the last bus home') was shot. 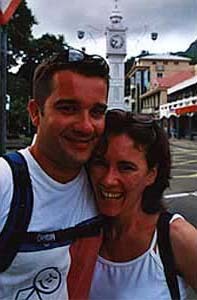 Petra and Gav pose in front of the 'Big Ben' clock in the centre of Victoria, the capital of the Seychelles. Mum makes a new friend. 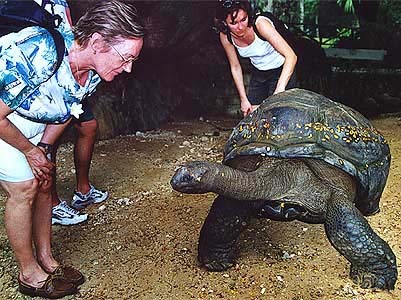 Sea turles are kept in captivity in a number of nature parks on the Seychelles, but they can also be seen in the wild. We were lucky enough to see a few smaller examples whilst diving just offshore. Angel fish at the exit to a swim-through. I had a very surreal experience with angel fish, who are naturally very curious and like the feeling of our air bubbles. They swarmed around the dive master and I during our safety stop. Circling in from the hidden depths, they became thicker and thicker until we were eventually swamped by fish and I couldn't see the dive master. Dad and Gav pose for the camera. Even dive masters can't always frame properly! A box fish trying to get away from me! 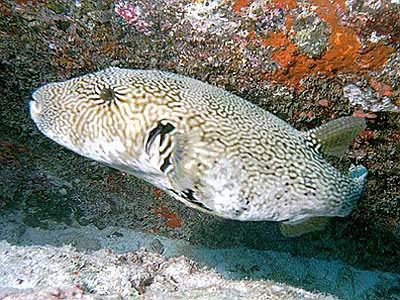 Box fish look normal until alarmed and they then swell to about three times their usual size, adopting a square form. Buster on my way down to the depths of the Labyrinth, a jumbled mess of large granite boulders at a depth of about 25m. The thrill is to dive through the passageways between these boulders, in dive-speak 'swim-throughs'. 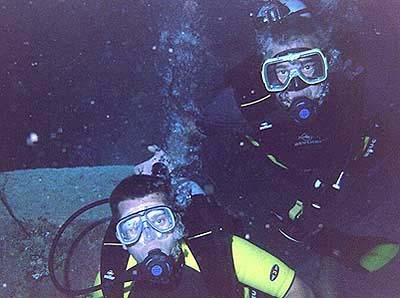 Not all diving experiences are so alarming. 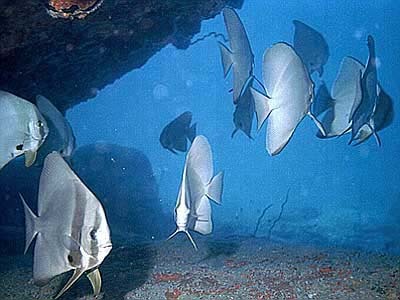 Most diving is a relaxed, effortless wandering through fish life which is most often very wary of you. 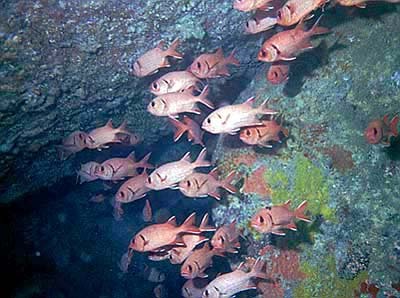 Here we roam through a shoal of red fish... any idea what they are? 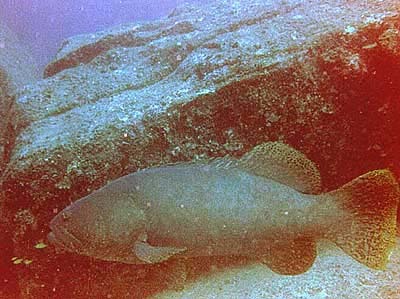 The Giant Grouper! You can't tell from this picture, but this fish was as big as me and weighed 300kg. You can imagine my surprise rounding a boulder to run smack into this monster. As he eye-balled us, Dad snapped these pictures: the only impression of scale is from the small yellow fish swimming in front of him. 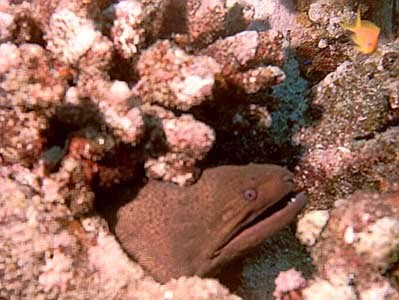 We only found out after the dive that Giant Grouper have caused unconfirmed fatalities! Petra and Gavin take a last whistful look at the view across the Indian Ocean from the outlook point we climbed to.